Carlsbad, CA – November 14, 2007 – The Consumer Electronics Association (CEA®) has announced that Pulse~LINK is the winner of two International CES Innovations 2008 Design and Engineering Awards. The Ultra Wideband (UWB) semiconductor company was honored for its innovation in developing the first UWB Wireless HDMI and HDMI-Over-Coax solutions for whole-home high definition video distribution. Pulse~LINK’s CWave® UWB Wireless HDMI reduces the rat’s nest of connector wires behind entertainment systems and allows clean installation of wall-mounted flat-panel displays anywhere in the room. The HDMI extender enables longer-range, real-time, secure wireless connectivity between the HDTV display and multiple entertainment source devices such as BluRay DVD, HD-DVD and Video Game consoles. HDMI (High Definition Multimedia Interface) has long been recognized for its high quality transport and content protection mechanisms, but is limited to single room applications. Pulse~LINK’s CWave® UWB HDMI-Over-Coax innovation extends this reach with no new wires, allowing consumers to access high-bandwidth HD content from a DVR, Blu-ray, HD DVD player or Set-Top Box in one room and display it in another room across the house. 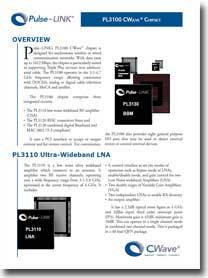 Other Pulse~LINK products based on the CWave® PL3100 UWB chipset include CWave® Ethernet-Over-Coax and CWave® 1394-Over-Coax solutions. All four “flavors” of Pulse~LINK’s revolutionary CWave home networking technology will be on show at various locations throughout CES 2008. Pulse~LINK is a pioneer in the commercialization of UWB communications and the first semiconductor company to deliver a wired and wireless solution with Gigabit data rates for true room-to-room networking of interactive High Definition content. Devices enabled with the Pulse~LINK CWave® UWB chipset allow HD video content, multi-channel audio and high-speed data located anywhere in the home to be shared across the existing coax backbone, in addition to wireless networking capabilities within each room. As a widely renowned consumer technology awards program that began in 1989, the prestigious Innovations Design and Engineering Awards recognize achievements in product design and engineering. It is sponsored by CEA, the producer of International CES, the world’s largest consumer technology tradeshow, and endorsed by the Industrial Designers Society of America (IDSA), the voice of industrial design, committed to advancing the profession through education, information, community and advocacy. Innovations 2008 honoree products are featured onwww.CESweb.org/Innovations, which lists product categories, as well as each product name, manufacturer information, designer, description, and photo. The Consumer Electronics Association (CEA) is the preeminent trade association promoting growth in the $148 billion U.S. consumer electronics industry. More than 2,200 companies enjoy the benefits of CEA membership, including legislative advocacy, market research, technical training and education, industry promotion and the fostering of business and strategic relationships. CEA also sponsors and manages the International CES – Where Entertainment, Technology and Business Converge. All profits from CES are reinvested into CEA’s industry services. Find CEA online at www.CE.org. Pulse~LINK, Inc. is a privately held Delaware Corporation headquartered in Carlsbad, California, with over 300 issued and pending patents pertaining to UWB wired and wireless communications. Pulse~LINK’s CWave® technology is a “no-new-wires” solution that delivers up to Gigabit data rates over coax and wireless networks from the same chipset, providing consumers with the unprecedented ability to stream high quality multimedia content throughout the home. CWave® solutions support simultaneous operation of 1394, Gigabit Ethernet, and HDMI over coax and wireless connections. For additional information about Pulse~LINK, Inc., please visit: http://www.pulselink.net.